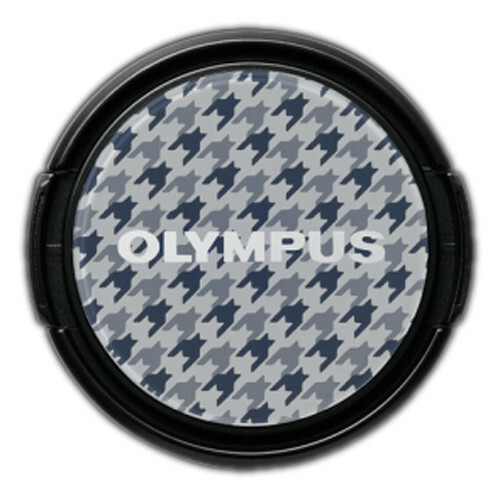 The LC-37PR Gray Checked Decorative Lens Cap from Olympus is a stylish alternative lens cap for lenses that fit the E-PM2 and E-PL5 digital cameras. The lens cap fits the M. ZUIKO DIGITAL 14-42mm f/3.5-5.6 II (R) and M.ZUIKO DIGITAL 17mm f/2.8 Pancake lenses. It is a side squeeze and snap-on type lens cap with a blue and gray checked pattern. This is a 37mm diameter lens cap. Its pattern matches that of the optional MCG-3PR custom grip for the E-PM2 and E-PL5 cameras. Box Dimensions (LxWxH) 2.6 x 2.4 x 0.9"
LC-37PR Gray Checked Decorative Lens Cap is rated 5.0 out of 5 by 1. Rated 5 out of 5 by Rover from Lens cap This is a wonderful lens cap. It covers the lens, like a cap. If you want a lens cap, you will not be disappointed in this product. It delivers, as promised, a cap for your lens.